Neutrogena unlocks the secret to fair and radiant skin by taking skincare whitening technology to new heights with the launch of the Neutrogena Fine Fairness, a line of skincare products specially formulated to brighten, protect and deliver fair, even-toned skin for healthy, lasting radiance. 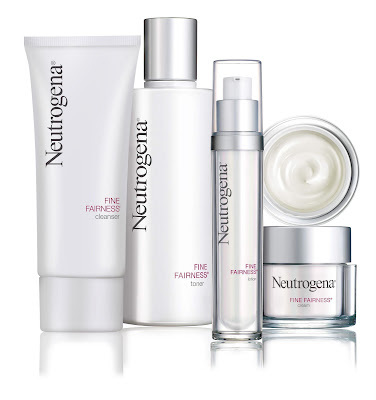 Each of the products under the Neutrogena Fine Fairness® Range work synergistically to help women achieve fair skin. With Neutrogena’s HealthyWhite™ Complex, a combination of natural ingredients that effectively work on the surface and deep within skin to provide women with visible skin-tone improvement. The unique combination of Essential Soy™, Niacinamide (Vitamin B3), Ascorbyl Glucoside (Stabilized Vitamin C) and Portulaca Extract (natural plant extract) make the Neutrogena HealthyWhite™ Complex the most technologically advanced skin lightening treatment that targets hyperpigmentation at its source. Essential Soy™ blocks or limits the transfer of melanin to keratinocytes (the epidermis or outermost layer of skin). This results in a more even skin tone and brown spot reduction. While Stabilized Vitamin C, a powerful antioxidant, blocks free radicals and reduces melanin formation by preventing the tyrosinase enzyme from converting tyrosine into melanin. This stable form of Vitamin C also ensures a long-lasting healthy glow and is known to protect the skin from sun-induced redness. Vitamin B3, on the other hand, is a water-soluble vitamin that works inside-out to renew cells, making skin appear more radiant and translucent. And lastly, Portulaca extract prevents pigmentation and blocks inflammation of the skin’s upper epidermis layer, thus making skin naturally softer. The Neutrogena Fine Fairness® range also contains retinol, otherwise known as pure Vitamin A, a proven anti-aging ingredient that enhances cell renewal and prevents the accumulation and production of melanin. It also makes the skin firmer as it decreases the breakdown of collagen and elastin, while stimulating the production of new collagen at the same time. The range also boasts of natural minerals such as mica and titanium dioxide that enhances the reflection of light off the skin, making the surface of the skin appear more radiant; while broad spectrum UVA and UVB Filters filter out both UVA and UVB radiation, thereby preventing long-term formation of uneven pigmentation and reducing melanin production. I remember using their Fine Fairness compact back in college. I love it because its suited for my young (back-then) skin for I've always known Neutrogena to be gentle and specifically made for sensitive skins. I never had the chance to use the old Fine Fairness skincare line for I opted to stay with my soap & water regimen. I must say that my skin problems was way simpler those days...I didn't have to worry about hyperpigmentation and acne scars. But now's a different story, year passed and now I have some acne scars that I have been trying to get rid of by using complicated whitening formulations that require prescription. I am not saying that they aren't effective, since they are. but to have a skincare regimen that would not just take care of our now-adult skin problems, but still be concerned on our still sensitive skin, would be a lot better! The Fine Fairness range is exclusively available in Watsons stores nationwide. So what are you waiting for? Hurry up and banish those ugly dark spots and say hello to whiter and healthier skin! tried the fine fairness way back when i was in the US. must say it really works for me esp with the cold weather there. however, using it here in the Phils made my skin more oily... :( didnt feel that it made my skin "fairer"... oh well, i guess it works for some people.